It is slightly sweet, yet still super savory. It cannot be eaten alone, and it best served with rice, noodles, or made into a sandwich à la bánh mì-style. I used all sorts of Asian flavors, so it’s not really associated with one country or cuisine. I guess it kind of encompasses everything, like a melting pot. There’s lemongrass, garlic, hoisin sauce, ginger, rice vinegar and soy sauce. 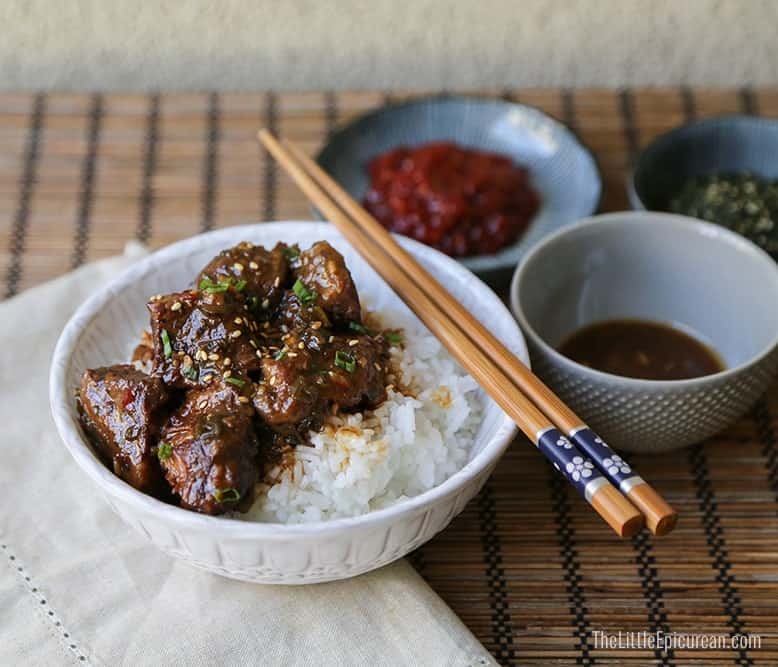 Just like other braised meat dishes, this tastes even better the following day once the meat has had time to rest and soak up all the flavors of the sauce. In a small bowl whisk together flour, salt, and pepper. Dredge cut beef into flour mixture. Shake off any excess flour. Set aside. In a medium sized skillet, add vegetable oil and warm up over medium heat. Once warm, brown (sear) beef in batches. Not need to fully cook meat, you just want to have a nice crust while cooking off the flour. 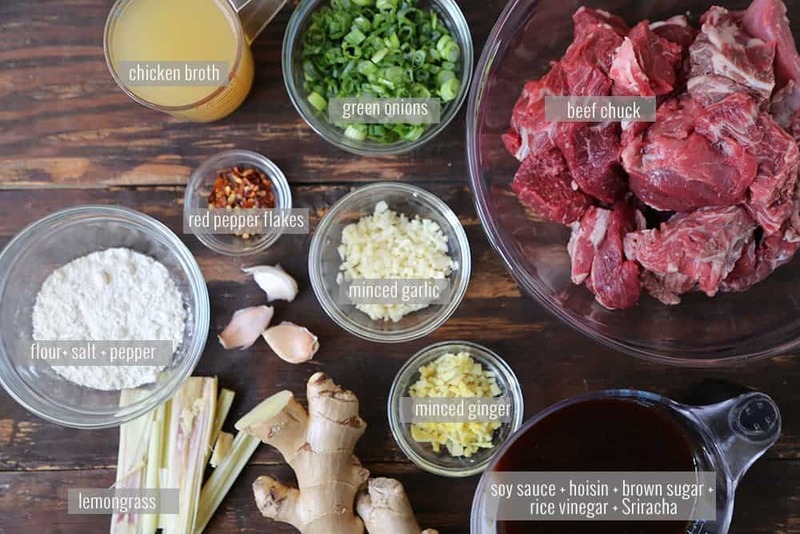 Place seared beef in slow cooker. In the same pot you cooked beef, add minced garlic and ginger. Cook until fragrant. Add lemongrass and cook until garlic begins to brown. Add red pepper flakes and chicken broth. Transfer mixture to slow cooker. 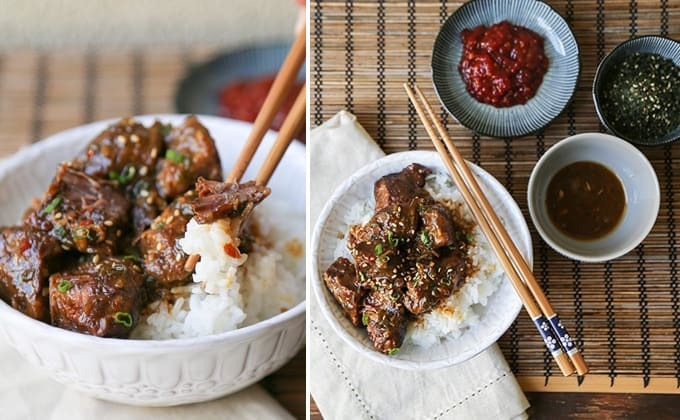 In a bowl, whisk together soy sauce, hoisin sauce, rice vinegar, brown sugar, and Sriracha. Add to slow cooker. Add green onions. Cover slow cooker. Cook for 4-5 hours on high heat, or 6-8 hours on low heat. Serve with rice, noodles or crusty bread.